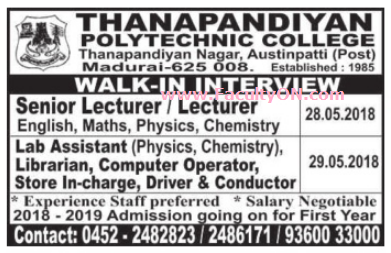 Thanapandiyan Polytechnic College, Madurai has advertised in the DINAMALAR newspaper for recruitment of Lecturers / Senior Lecturers Plus Non-Faculty jobs vacancies. Interested and eligible job aspirants are requested to walk-in on 28th and 29th May 2018. Check out further more details below. About College: Thanapandiyan Polytechnic was established in the year 1985 by Sasikala Memorial Educational Trust under the able guidance of our Chairman LION .Thiru R.Pandian M.A. The institute offers six diploma courses in CIVIL, MECH,AUTO,EEE,ECE and CSE. The Institute is strategically located near the Kappalur industrial estate in a serene atmosphere.